Product code: ES7607 Categories: Art Deco, Art Deco Rings & Art Deco Engagement Rings. Here is a magnificent French Art Deco untreated sapphire and diamond ring that is just spectacular for so many reasons. To begin with, it has been known for centuries that if a sapphire or ruby is heated, this can improve its colour and clarity. This is a permanent treatment that is a worldwide accepted practice. It should be emphasised, that a sapphire or ruby that has been heat treated is still a natural stone and not man-made. However in this ring it is set with a sapphire besides being facetted, is as it was when it came out of the ground. The sapphire measures an impressive 5.40 carats and has such a fine blue colour to it. 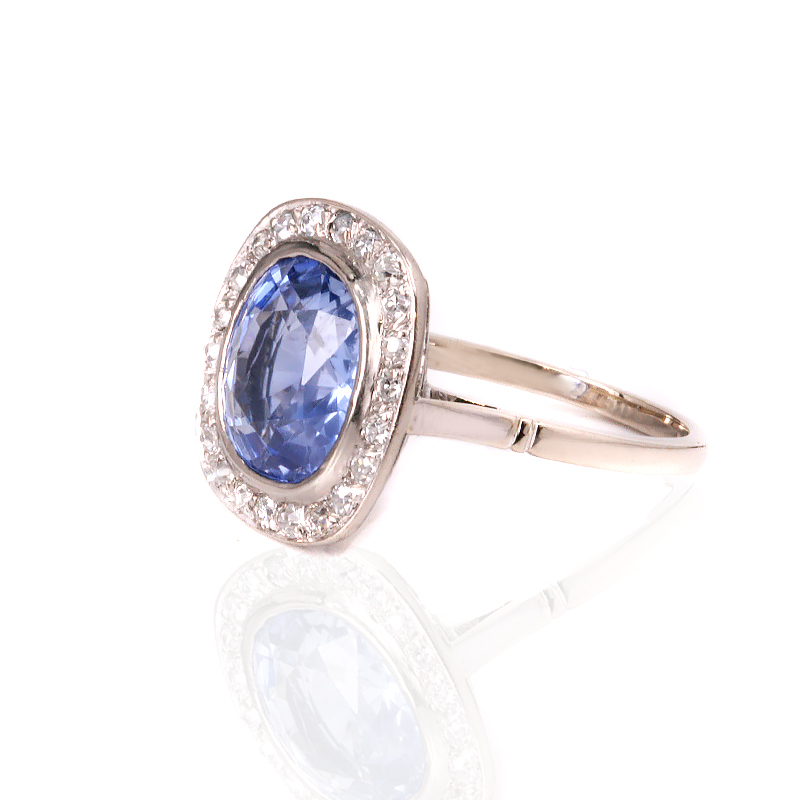 This sapphire is just gorgeous and will have you admiring its colour day or night. And then to highlight the sapphire, it is surrounded by twenty two single cut diamonds to add to the sparkle and elegance of the ring. The diamonds total 0.22 carats and highlight the ring and sapphire to well without ever being too over the top or ostentatious. The ring measures 14.4mm from left to right by 15.8mm and sits so perfectly on the finger. 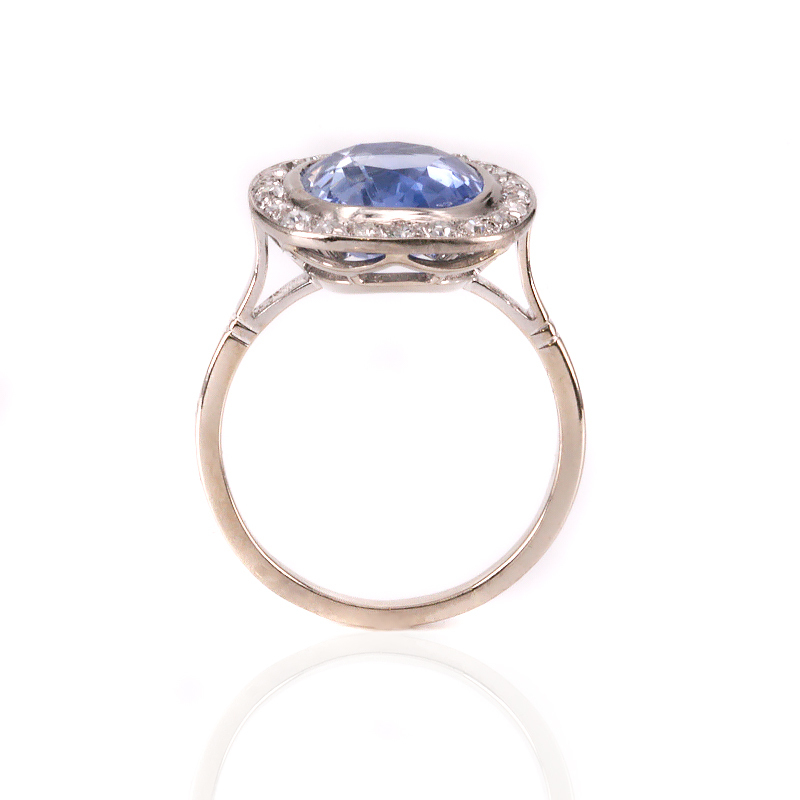 This ring has so many wonderful features from the elegance of the Art Deco era, the design to that wonderful untreated sapphire sitting proudly in the centre, that all come together to make this such a unique and wonderful ring. Tag: Art Deco sapphire and diamond ring. French Art Deco untreated sapphire and diamond ring. Hand made in 18ct white gold in the 1920’s, this sapphire and diamond combines the elegance of the Art Deco era with the wonder of the untreated sapphire. Sapphires and rubies have been heat treated for centuries to improve their colour and clarity and this is a worldwide accepted practice, however it is estimated that only between 1% and 5% of sapphires are good enough to be set into jewellery without being treated. It should be clarified that a sapphire or ruby that has undergone some form of heat treatment is still a natural gemstone from the ground and is not a synthetic/man made stone and the treatment is completely stable. Lately on the market there is a technique of glass filling or lead filling stones which will improve the colour of a natural gemstone, however this treatment is very unstable and the stone may look worse in a few years.